Despite its reputation for blandness, the Soviet era produced some amazing architectural gems. The best of these is probably Lenin's Mausoleum, but there are many others as well. This former Exhibition of Economic Achievement was at one time a permanent World Expo of the great glories of Soviet--and particularly Stalinist--rule. It began in 1939 as the All-Union Agricultural Exposition, a celebration of the fruits of Stalinist progress, and many of its most grandiose elements date from that period. In ensuing decades the VDNKh was revived and eventually established on a permanent basis, becoming an exhibition of the finest achievments of the Soviet state. While the VDNKh is slowly restructuring itself to a less idealistic showroom for consumer goods from all over the world, it remains a truly outstanding place to visit, a kind of crazed Soviet visionary's wonderland. 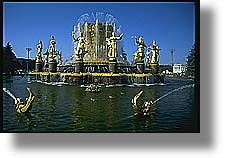 VDNKh encompasses a wide area and is filled with pavilions for everything from grain and furs to atomic energy. Many of these exhibition spaces still offer interesting and informative displays. However, what many find most fascinating is the overall dimension and vision of Soviet state imagination. Among the most interesting sights at VDNKh are the monumental Soviet realist sculpture "Worker and Woman Collective Farmer," the gleaming jet-age Space Obelisk, the imposing Stalinist Central Pavilion, and virtually all of the Stalinist-era trade pavilions. Between December 25 and January 5 each winter, the VDNKh is the venue for a Russian Winter Festival, replete with folk music and dancing as well as troika rides. Moscow's grand metro stations, make those of the great western capitals look tawdry in comparison. For New Yorkers in particular, a visit to Moscow's metro induces severe station envy. The first and still the finest of the Moscow metro stations were the product of a Stalin's first Five-Year Plan. The system was begun in 1931, and the first line opened four years later. Many stations worth checking out--a few in particular are as worthy of a visit as any sight in the city. Mayakovskaya Station, completed in 1938, features a central hall supported by lovely stainless steel and red marble columns, which soar up to a ceiling festooned with socialist realist mosaics. 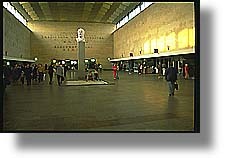 Other notable stations include Ploshchad Revolyutsii, where the passageway arches are supported by vivid sculptures of Red Army soldiers, and Kropotkinskaya Station, with its elegantly-columned platform and upper galleries. The Lubyanka has only recently shed some of its historically sinister character. The building was taken over by the Bolsheviks in 1918, and soon afterward began its long role as the headquarters of the notorious Soviet secret police. First known as the NKVD and later as the KGB, the secret police for decades used this building not only as an administrative headquarters but also as an interrogation center and temporary prison. Today it is home to the FSK, the Russian domestic intelligence service. Copyright (c) 1996-2006 interKnowledge Corp. All rights reserved.